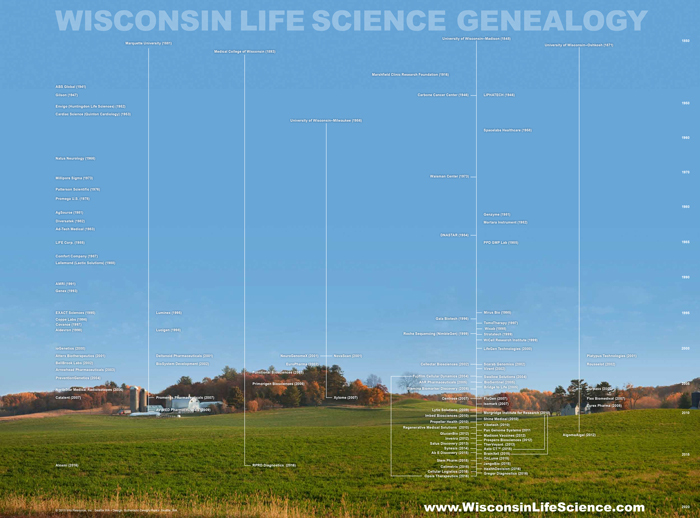 We invite you to explore Wisconsin Life Science Genealogy, a one-of-a-kind image that illustrates the founding technology origins of nearly 120 life science firms located in Wisconsin. Specifically, the origins of the companies' founding technology with the state's universities and non-profit research organizations -- longstanding centers of innovation, technology transfer and job creation. To access the poster, please click on the image below (516 kb PDF). Wisconsin Life Science Genealogy 2018 © Info.Resource, Inc.